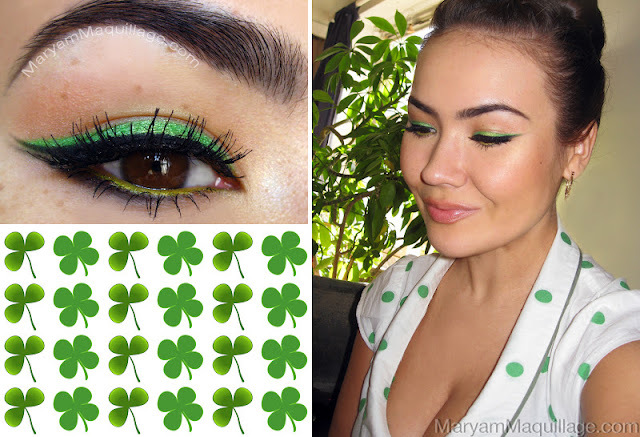 Maryam Maquillage: Kiss Me, I'm... Lucky! If you've been reading my blog for a while, you know that I tend to shy away from green eye shadows and barely have any green in my wardrobe. I always fear that green makeup and clothing make Asian skin look jaund-ish, so I admit to being a bit hesitant when it comes to this color. For St. Patty's, however, I'm changing it up and embracing my inner Leprechaun--after all, it is the true color of spring time and I'm definitely eager to find my pot of gold! To warm up my yellowish skin, I decided to go heavy on the blush--this is my trick to counteracting the green effect. Braid / Bun Combo: for instructions, visit Beautylish!! One doesn't have to be Irish to join in the fun! How will you be celebrating? So simple and yet so pretty. 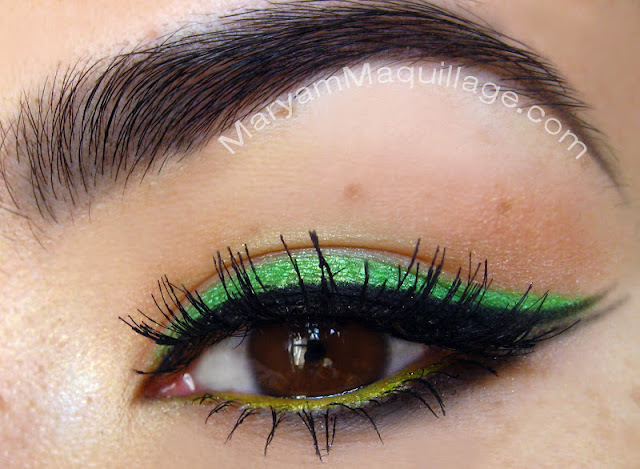 The chartreuse on the lower waterline is my favorite part. Oh how I wish I didn't look pukey and sickly in green, else I might actually enjoy celebrating my Irish heritage! But I will take the kiss, ow ow! wow! Love your hairstyle and makeup. It just looks so simple and pretty! Gorgeous! I've done green before but never a kelly green shadow. Although I have used kelly green eyeline and love that. Maybe I'll give it a whirl this weekend. Love this! Everyone usually goes overboard with green around this time. I love your festive version!! All your posts are so insipiring, love this green make up! Any suggestions about purple eye liner? Beautiful! Green looks great on you. wow! this green color is so beautiful! Wow this look is so pretty, I can honestly say I have never touched the green shadow in my eye pallet..
thanks Holly, I totally never used that green either until this look!! You are so cute and fresh! I love all the look like always :o), hair style is fantastic! Xoxo V.V. What kind of camera do you use? I am shopping around for one now since I am hating my current camera. Thought I would ask since your pictures always come out great. Fresh, fun and simple! Definitely a wearable look! muahhhhhhhhhhhhhhhhh love the look love the mix of green and yellow just perfect!!! The green looks great, especially "honey". Stunning look. The greens you have chosen are so pretty. love love love the bun! Your shirt is so cute! & I love the makeup of course! So pretty! That's perfect even for days other than St. Patrick's. I'm a new follower, follow back if you like. oh dear this is so cute, very neat and perfect for spring!!! green is also my favourite color.. love it!!! hope you'll have a great weekend!!! Okay first, I couldn't help but love your freckles in this post. I don't know why! I do! You did a beautiful job and I love the waterline shade - it doesn't fade away and is just as integral a part of the EOTD as the other parts. I love the green! It's so pretty. Your top is ADORABLE! Yes yes I would kiss you! xoxoxoxoxoxo!!! I love how the green makes your eyes look SO brown babe! You look amazing. So pretty! Goodness gracious you are simply stunning gorgeous in the green dress & eye make up. Your skin is glowing golden & radiant. There is nothing Jaundish about it. Guess you made sure you wouln't get pinched. lol :) I love your makeup. Gorgeous! Gah, Graffiti just looked so much prettier in your look. So pretty!I love the green eyeliner! stunning make up!!! your eyes are amazing really!!! Kissing in public is taboo here but you seem to deserve it. I love that green eyeliner! Your hairstyle looks very sophisticated and chic. Another look that I'm going to have to try!